Much has been written about what makes Google work so well: their ridiculously profitable advertising business model, the technology behind their search engine and data centers, and the amazing pay and perks they offer. My experiences investing in and working with startups, however, has taught me that building a great company is usually less about a specific technical or business model innovation than about building a culture of continuous improvement and innovation. 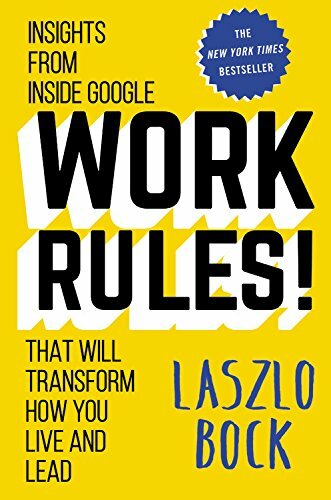 To try to get some insight into how Google does things, I picked up Google SVP of People Operations Laszlo Bock’s book Work Rules! Bock describes a Google culture rooted in principles that came from founders Larry Page and Sergey Brin when they started the company: get the best people to work for you, make them want to stay and contribute, and remove barriers to their creativity. What’s great (to those interested in company building) is that Bock goes on to detail the practices Google has put in place to try to live up to these principles even as their headcount has expanded. Presume trust: Many of Google’s cultural norms stem from a view that people are well-intentioned and trustworthy. While that may not seem so radical, this manifested at Google as a level of transparency with employees and a bias to say yes to employee suggestions that most companies are uncomfortable with. It raises interesting questions about why companies that say their talent is the most important thing treat them in ways that suggest a lack of trust. Recruit the best: Many an exec pays lip service to this, but what Google has done is institute policies that run counter to standard recruiting practices to try to actually achieve this at scale: templatized interviews / forms (to make the review process more objective and standardized), hiring decisions made by cross-org committees (to insure a consistently high bar is set), and heavy use of data to track the effectiveness of different interviewers and interview tactics. While there’s room to disagree if these are the best policies (I can imagine hating this as a hiring manager trying to staff up a team quickly), what I admired is that they set a goal (to hire the best at scale) and have actually thought through the recruiting practices they need to do so. Pay fairly [means pay unequally]: While many executives would agree with the notion that superstar employees can be 2-10x more productive, few companies actually compensate their superstars 2-10x more. While its unclear to me how effective Google is at rewarding superstars, the fact that they’ve tried to align their pay policies with their beliefs on how people perform is another great example of deviating from the norm (this time in terms of compensation) to follow through on their desire to pay fairly. Be data-driven: Another “in vogue” platitude amongst executives, but one that very few companies live up to, is around being data-driven. In reading Bock’s book, I was constantly drawing parallels between the experimentation, data collection, and analyses his People Operations team carried out and the types of experiments, data collection, and analyses you would expect a consumer internet/mobile company to do with their users. Case in point: Bock’s team experimented with different performance review approaches and even cafeteria food offerings in the same way you would expect Facebook to experiment with different news feed algorithms and notification strategies. It underscores the principle that, if you’re truly data-driven, you don’t just selectively apply it to how you conduct business, you apply it everywhere. Of course, not every company is Google, and not every company should have the same set of guiding principles or will come to same conclusions. Some of the processes that Google practices are impractical (i.e., experimentation is harder to set up / draw conclusions from with much smaller companies, not all professions have such wide variations in output as to drive such wide variations in pay, etc). What Bock’s book highlights, though, is that companies should be thoughtful about what sort of cultural principles they want to follow and what policies and actions that translates into if they truly believe them. I’d highly recommend the book!